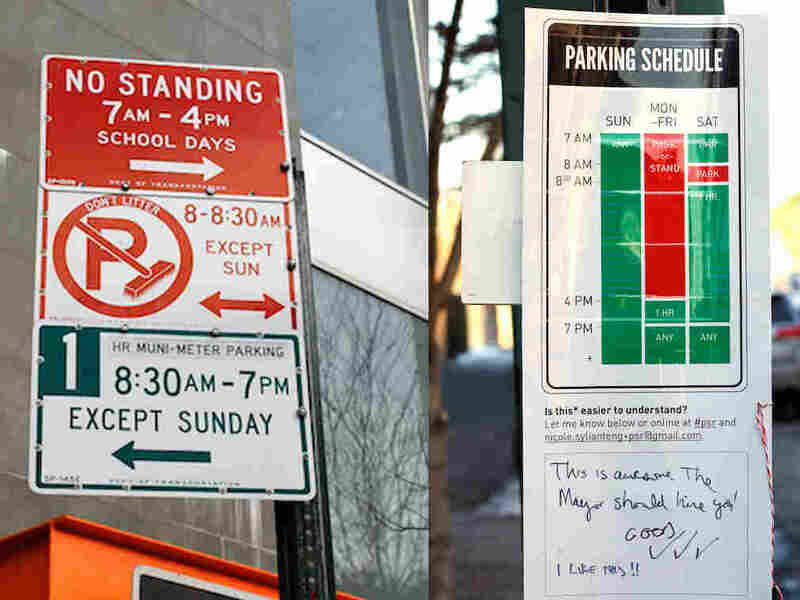 A Well-Designed Parking Sign Can Make Life Much Easier Is it safe to park on the street, or are you risking a ticket? The more signs there are, the more confusing that question gets. Designer Nikki Sylianteng has found a way to help. Which parking sign is easier to understand? Nikki Sylianteng is trying to build a better parking sign at her website, To Park Or Not To Park. One of her redesign efforts can be seen at right. Is it safe to park on the street, or are you risking a ticket? The more signs there are, the more confusing that question gets. Designer Nikki Sylianteng is trying to fix the problem through visual design. You can see various iterations of her sign at her website, To Park Or Not To Park, and you can hear her discuss her project at the audio link above.